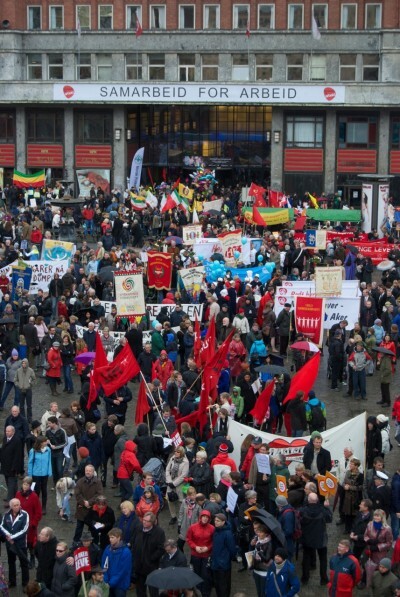 Thousands of champions of Norway’s social welfare state defied cold, wet weather on Saturday to march through the streets and celebrate the working folks. 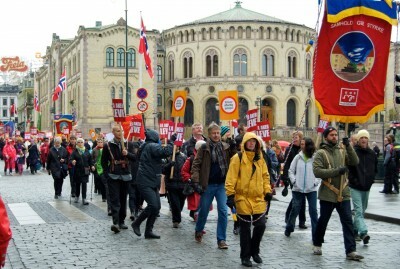 May 1st may simply be a flowery “May Day” elsewhere, but in Norway it’s an important, traditional tribute to organized labour. Flags adorned the streets and flew all around City Hall in Oslo, just like on Norway’s Constitution Day on the 17th of May. Many marchers and labour rally participants, armed with colourful banners, dressed up for the event, wearing suits and ties and dresses, while others opted for work uniforms and warm jackets. Prime Minister Jens Stoltenberg ultimately had to put on a winter coat over his own suit and tie when he addressed the crowd in Lillehammer on Saturday, after first attending a Labour Party breakfast in Hedmark. While he could boast about Norway’s low unemployment rate, he expressed deep concern about the “very, very serious situation” in Greece and other European countries. The global finance crisis, he said, has now become a “job and debt crisis,” and that can force many countries to drastically cut their public spending. They won’t be able to afford new stimulus packages, and that in turn can lead to a new decline in the global economy. 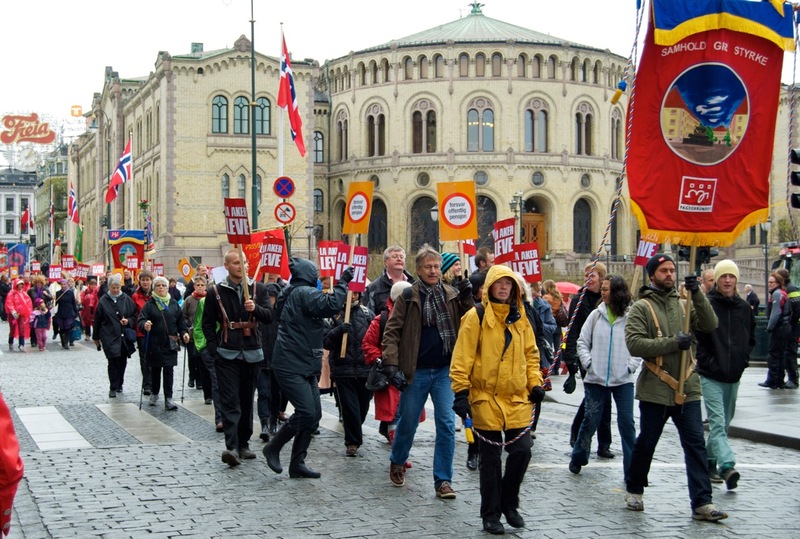 In Oslo, the head of labour federation LO called for more resistance to what he calls “social dumping,” where immigrant or foreign guest workers are paid less than Norwegian workers. LO boss Roar Flåthen, who led the parade from the rally site at the public square Youngstorget, also feared that rising unemployment among young people will lead to social unrest. Those out celebrating May 1st weren’t only sounding off on labour issues, but also a long list of other political issues. Huge banners hung from buildings around the square opposed oil and exploration off Lofoten, demanded that local hospitals be kept open and operating, advocated more anti-poverty campaigns and preservation of pension programs. And it wasn’t just the socialist party leaders who were out in full force on May 1st. Siv Jensen, head of Norway’s conservative Progress Party, spoke at an outdoor rally in Drammen and claimed Stoltenberg’s low unemployment figures are too optimistic. Jensen claimed the real unemployment rate is worse than the government portrays, and she said she included herself in the definition of “ordinary working folks.” She praised Norway’s entrepreneurs and small business owners especially, noting that they have created many jobs. As the parades and rallies wound down, to the shouts of “gratulerer med dagen,” (congratulations on the day), it was possible to head for open restaurants, cafés, the cinema and even many stores, including a local record shop in downtown Oslo. That would have been unheard of just a generation ago, when nearly all businesses were expected to close on the May 1st public holiday.